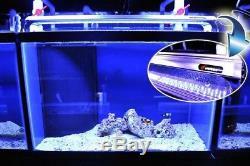 Finnex Marine+ II 30 Saltwater LED Aquarium Light 10,000K AL-M30DB Fugeray. 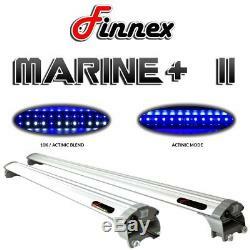 The new Finnex Marine+ 2 packs the light output of the original Marine+ in a much more economical package. This Contemporary Ultra Slim designed LED fixture features a series of LEDs to promote Saltwater Refugium and Freshwater growth. Unlike the Ray 2 which integrates multiple High Output LEDS pinched together for high light output, the Marine+ II features a more evenly spaced LED alignment ideal for frag tanks as well as aquariums that need low to medium light. All Finnex light fixtures feature a moisture resistant PC Splash Guard to safeguard against water mishaps. This all-around multipurpose light also features its actinic moonlights on a separate switch, which can be activated during the evening to give a pleasing moonlight tone, further making corals vibrate throughout the aquarium. The durable high output LED bulbs are built to last 40,000 hours or more. The Marine+ II has an LED spread of 120 degrees. A unique leg fixture allows this LED light to mount on different sized aquariums and sump setups. To extend LED bulb longevity, the circuit boards are constructed with top-quality aluminum and the fixture itself acts as a heat sync to allow ample cooling and superior heat dissipation. 30 Unibody Ultra Slim High Output Saltwater LED. Perfect Fish Only, Softie, LPS Reef Lamp. (36) 10000k + (60) Actinic Blue LEDs, Separate switches. 25 Watt Coral Supporting Fixture. The power value of standard incandescent lamps. Looking for more Finnex lights? Welcome to 10,000 Great Deals where we hope to offer you some of the most exciting products at the best prices on the Internet! We try and quench your thirst for shopping from products that are highly necessary to products that are completely weird. This Item is BRAND NEW. Save all packing material and original boxes. If free item was given with the product, the customer must return the free item in non-used original condition. Q: Is there any more information available for this product? A: Unfortunately, all of the information that we have about this item is already posted in our product description page. Their sites frequently contain details about an items specification such as physical dimensions, size, weight, included accessories, format, edition, version, color, etc. Q: Can I request a size, type, color or any other specific request? Please send us a message before purchasing if you are looking to make a special request, so that we may check to see if the option is available. Powered by SixBit's eCommerce Solution. The item "Finnex Marine+ II 30 Saltwater LED Aquarium Light 10,000K AL-M30DB Fugeray" is in sale since Friday, February 16, 2018. This item is in the category "Pet Supplies\Fish & Aquariums\Lighting & Bulbs". The seller is "10000greatdeals" and is located in Kankakee, Illinois.